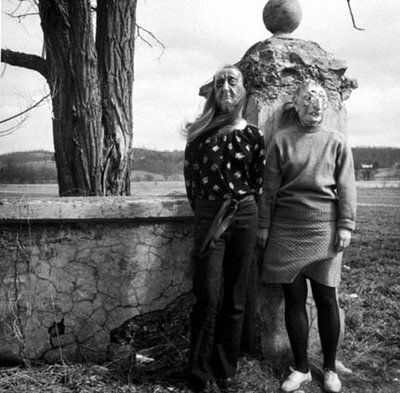 "The photographs of Ralph Eugene Meatyard defy convention: they have been called visionary, surrealistic, and meditative. Whatever the label, these evocative images of friends and family and the natural world around his home illustrate a delicate psychology of human interaction. Meatyard was trained as an optician, a profession that he maintained all his life in Lexington, Kentucky; he bought a camera in 1950 for the sole purpose of photographing his first-born son. But shortly thereafter, he joined the Lexington Camera Club and developed a friendship with his photography teacher Van Deren Coke, as well as a circle of local writers and photographers, including Guy Davenport, Thomas Merton, Wendell Berry, Jonathan Williams, and Minor White. Family and friends freely participated in Meatyard's staged and mysterious images, which often involve masks and abandoned spaces, and obliquely reference social, political, and cultural issues. A key subject in Meatyard's work is the natural environment, which is featured in his "Light on Water" series, in which long exposures seem to create calligraphic texts, and his No-Focus series, in which he deliberately photographed stems and twigs out of focus. In one of his last series titled Motion-Sound, the pictures were made by moving the camera gently, creating multiple exposures of the woodland scenes that suggest abstract sound patterns. The book accompanies an exhibition organized by ICP Assistant Curator Cynthia Young with acclaimed writer and Meatyard friend, Guy Davenport, who also wrote the text. Also included are the exhibition history, chronology, and bibliography. Essay by Guy Davenport." The quote above is the publisher's description of the recently reissued book.